Besides absolutely perfect weather and a fantastic location right in the middle of some of the biggest attractions in the world (including Walt Disney World, Universal Studios, and Cape Kennedy just down the road a little ways… just to name a few), Orlando was a great location for this year’s National Biodiesel Conference and Expo because of the good example the area shows in the use of biodiesel. Earlier, we told you about Universal Studio’s use and expansion of the use of biodiesel at its theme park. Universal is using biodiesel for all of its mobile diesel engines, including the JAWS ride. A couple of other local Orlando-area entities recognized at the “Eye on Biodiesel” awards ceremony for their use of biodiesel include Florida Power and Light (which won the NBB’s Initiative Award) and NASA’s Kennedy Space Center (winner of the Pioneer Award). 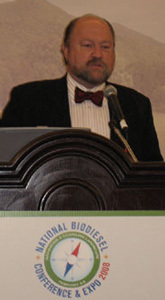 Director of Florida Power and Light’s Fleet Services George Survant, talked about his company’s use of biodiesel during a press conference following the awards program. The utility converted its entire diesel fleet of almost 2500 vehicles to B20. He says the fuel comes from North Florida and the soybeans are locally grown. 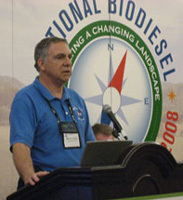 Bruce Chesson with NASA Transportation picked up the Pioneer Award for his agency, as NASA was recognized for switching to B20 in 2003 in its fleet of 144 diesel-powered vehicles. “It was pretty much the easiest of switchover any alternative fuel that we could go ahead and operate,” Chesson said. He also hinted that NASA is looking at some type of renewable fuel for its rockets… but couldn’t give any details just yet.